The Trump administration has shown that it is more than capable and willing to take advantage of any event, regardless of the sensitivities, to reap political fodder. The recent mass shooting at Marjory Stoneman Douglas High School in Parkland, Florida, in which 17 students lost their lives, is no different. Trump and his supporters have used the incident to call for the arming of school teachers, even though an overwhelming majority of teachers and school administrators have rejected the idea as ludicrous. 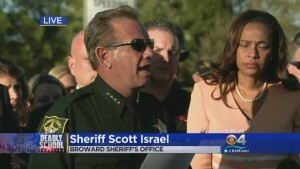 A major red flag in the incident has been raised with comments made by Broward County Sheriff Scott Israel [pictured, right]. County sheriffs in Florida are elected positions. Israel, a native of New York City, began his police career with the Fort Lauderdale Police Department. In 2012, Israel was elected as Broward County Sheriff as a Democrat. However, Israel, a former registered Republican, is no ordinary Democrat. In his 2012 race, Israel received the backing of Republican dirty tricks operative Roger Stone, a resident of Coral Springs in Broward, whose sleazy work extends back to the Richard Nixon administration and encompasses the campaigns of Ronald Reagan, John McCain, and Donald Trump. Stone was involved in dirty tricks operations against CBS anchorman Dan Rather and New York Governor Eliot Spitzer. In many ways, Stone makes longtime GOP operative Karl Rove, himself no stranger to dirty tricks, look like a saint by comparison. No sooner had he been elected Broward County Sheriff, Israel hired Michael Colapietro, Stone’s co-author of the books “The Man Who Killed Kennedy—The Case Against LBJ” and “Nixon’s Secrets,” as a Sheriff’s Department community affairs specialist. Another community affairs specialist hired by Israel was Stone’s book publicist, Jennifer “Jen” Hobbs. Together with his friend Andrew Miller, who runs the blog Broward Bugle.com, Stone has backed Israel politically. Stone and Miller have defended Israel against charges of excessive force by police officers in Broward County. Israel also hired chairwoman of the Libertarian Party of Miami-Dade County and Miami Tea Party co-founder Dianne Thorn as the sheriff’s assistant chief of staff. It just so happened that Thorn was Stone’s longtime personal assistant and Miller’s former step-mother. Israel is being criticized for the way his department handled the high school shooting carried out by former student Nikolas Cruz. Although one sheriff’s deputy assigned to the Parkland high school resigned after failing to enter the school after Cruz began to open fire with an AR-15 assault rifle and two others are under investigation for failing to heed prior warnings the department received about Cruz, Israel is refusing to take any responsibility for the bloody mayhem. There are calls from 73 GOP state representatives for Governor Rick Scott, a Republican and Trump supporter, to remove Israel from his sheriff’s position. Given the close ties of Israel to Stone, Trump’s unofficial political adviser, that is unlikely. Israel’s membership of the Parkland Chabad House (known as a front for Mossad activities) and his endorsement of the teachings of the Talmud have ensured that he is immune to political pressure in Broward County, which has a politically-influential Jewish community. The Coral Springs police officers who arrived at Stoneman High School to find four Broward deputies waiting outside the school as Cruz carried out his killing spree are not so taken with Israel’s “leadership” qualities. Coral Springs police officers were the first to enter the school and Coral Springs Police Chief Tony Pustizzi was irate that Israel took all the credit for the enforcement response to the shooting and the efforts of the Coral Springs Police and Fire Departments were largely ignored. Israel appears to be at the nexus of failures to coordinate red flag warnings received about Cruz by Broward County mental health officials, the local FBI office, neighboring Palm Beach County law enforcement officials, and his own sheriff’s department. Arch-conspirator and health supplement flim-flam salesman Alex Jones, who features Stone on his broadcasts, downplayed Stone’s connection to Israel, claiming he just “had dinner with the sheriff.” Jones’s ignoring Stone’s close relationship with Israel, whom Jones erroneously called “a big Hillary boot-licker,” is in keeping with the constant stream of lies and misinformation disseminated by Jones, Stone, their propaganda acolytes, and their number one fan, Trump. Stoneman High School was not the first major shooting incident on Israel’s watch. On January 6, 2017, just fourteen days before Trump’s inauguration, a former member of the Puerto Rico and Alaska National Guard, Esteban Santiago-Ruiz, arriving at Fort Lauderdale-Hollywood International Airport on a Delta flight from Anchorage via Minneapolis, unpacked his luggage in the baggage claim area. In a restroom, Santiago-Ruiz loaded a 9-millimeter automatic pistol he declared in his checked-in baggage in Anchorage and proceeded to open fire on other passengers in the baggage area, killing five and wounding six. Santiago-Ruiz was known to the FBI office in Anchorage as a mentally disturbed individual and he was eventually fired by his private security firm employer, Signal 88 Security, which is based in Omaha. In 2007, Signal 88′s CEO was featured on Fox News [pictured, left] after Richard Hawkins entered Westroads Mall in Omaha—whose owners have strong Israeli connections—opened fire, killing eight shoppers. There were immediate calls for metal detectors to be installed at entrances to shopping malls across the United States. The Fort Lauderdale airport investigation was stymied by the leak of an airport videotape of the shooting to the media. Broward County Sheriff’s Deputy Michael Dingman was discovered to have leaked the video to TMZ. Although Dingman was suspended—with pay—considering the number of Stone cronies working within the Broward Sheriff’s office, the videotape leaking points to a consistent problem with videotape tampering in Broward. The airport incident in Fort Lauderdale resulted in calls for enhanced security at outer perimeters of U.S. airports, a business that Israeli-owned aviation security companies are all-too-eager to accommodate. In the Fort Lauderdale airport incident, Trump’s supporters pointed to the shooter’s Hispanic ethnicity, even though Puerto Ricans are U.S. citizens. The shooting merely fed into the repeated anti-Hispanic gaslighting by Trump. When Coral Springs police officers arrived at Stoneman High School they were confused by what was billed as real-time security video streaming from inside the school. The real-time video images, broadcast by Broadcastify, an audio streaming website, were “delayed 20 minutes.” The Coral Springs cops believed Cruz was still shooting inside the school when he was long gone and sitting at a nearby McDonald’s restaurant. Broward County serves as a nexus for Israeli intelligence and “Eurasian Mafia” and it hosts the Trump Hollywood Condo complex, which has attracted as buyers several dodgy characters with ties to Eastern European and Israeli organized crime. Broward and Hollywood, in particular, also served as a center for suspicious pre-9/11 activity, as previously reported by WMR. 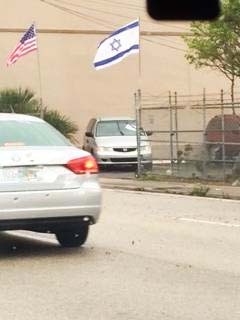 Hollywood [pictured, left, along Dixie Highway main thoroughfare], Fort Lauderdale to the north, and Hallandale and Aventura to the south lie in the heart of Broward County, which is heavily populated by Jewish transplants from New York City, like Sheriff Israel. Our sources in Broward continue to pose one major question: Why would alleged lead 9/11 hijacker Mohammed Atta and his team have been cruising bars and causing scenes in a city with a large Jewish population, just four days before the Arabs were to carry out the “crime of the century”—the hijacking of four passenger planes in order to fly them into the World Trade Center, Pentagon or White House, and the U.S. Capitol building? And why would Atta and his team have chosen to use a mail drop at a rental mailbox store in a shopping center catering to Jewish residents, next door to a kosher restaurant? In fact, the mail drop was practically located across the street from the apartment complex that housed at least one of the Israeli “art students” believed by U.S. intelligence to have been part of an Israeli intelligence team. Hollywood was one of several cities where the addresses of the Israeli art students closely matched up with those of the alleged hijackers. Scott Israel not only has a lot of explaining to do over Marjory Stoneman Douglas High and Fort Lauderdale-Hollywood International but the use of his county by unsavory criminal syndicates linked to Trump and deplorable conspiracy propagandists associated with the likes of Alex Jones. Trump, for his part, has said he is envious that 9/11 raised George W. Bush’s presidential popularity to over 90 percent. The Parkland shooting occurred as the Justice Department Special Counsel’s investigation of Trump, his administration, and campaign team was reaching a crescendo. What part did Trump’s dirty tricks team play in diverting attention from the federal courthouse in Washington, DC, to Marjory Stoneman Douglas High in Florida?